Having a furry friend live with you means lots of cuddles and emotional support but it can also be a nightmare to get rid of all the hair that dogs and cats leave on your sofa or carpet. That shouldn’t limit your love for your pet because now there are easy and efficient ways of getting rid of dirt that is associated with having pets at your house. Companies are coming out with specialized vacuum cleaners that not only help you clear out dust and other substances from your furnishings and floors, but also concentrate on pet hair. One such cleaner made by Miele is the Miele Blizzard CX1 Cat and Dog PowerLine, one of the best products in the category of pet-specific vacuum cleaners. So no need to fret over the small things anymore, keep reading for all you need to know about Miele’s Blizzard CX1! Miele Blizzard CX1 Cat and Dog PowerLine is a specialised vacuum cleaner that helps you get rid of all the stray hair that you have around the house if you have pets. It is equipped with four levels of power along with a turbo head attachment that is designed to pick up pet hair more efficiently. The vacuum cleaner is very user-friendly with all attachments being stored in the cleaner itself so that you do not have to worry about lugging around separate parts. The Miele Blizzard CX1 Cat and Dog PowerLine is a bagless vacuum cleaner that comes with a dust canister that is easy to empty and clean. Its dusting brush comes within the handle and allows for better cleaning of finer dust particles. With a life of about 20 years, the quality of the equipment is much better than other similar cleaners, making Miele’s bagless vacuum cleaner ideal for pet owners. Miele’s Blizzard CX1 boasts of airflow that exceeds 100 km/h to make sure that the equipment is successful in pulling up even the tiniest bits of fine dust and coarser materials. The vacuum cleaner’s efficient floorhead, combined with optimum airways and a great motor, lead to very high air throughput. The vacuum cleaner has smart sensors that are capable of measuring the air throughput of the Gore CleanStream fine dust filter. If the machine senses the requirement of the ComfortClean self-cleaning function, it is automatically activated. In order for this to happen, the unit will turn off for about 20 seconds. This mode can also be activated manually for a high cleaning performance. Miele’s Blizzard CX1 is equipped with integrated tools like the upholstery nozzle, crevice nozzle, as well as the dusting brush, for greater ease of use. One of the main features of the Blizzard CX1 is the Click2Open mechanism that is installed in the vacuum cleaner’s emptying container. This allows the flap to open at a full 180°, which means that all the coarse dust and dirt will fall directly into the bin. This helps in avoiding the creation of a fine dust cloud. The vacuum cleaner comes with four power levels that can adjust suction according to your specific needs, giving you the best possible results. Innovative 900 W Motor: The product comes with an innovative and powerful 900 W motor that has fan blades which are specifically designed to produce a strong air flow consistently. Long Operating Radius: Miele’s Blizzard CX1 boasts of an impressive 10-metre radius that allows you to move from surface to surface without the worry of losing power or suction. Impressive Floorhead: The product’s floorhead is specially designed to be airtight so that there is no chance for dust to stay in areas that have been vacuumed. High Air Flow and Velocity: The vacuum cleaner comes with the Vortex technology that produces airflow with a velocity of more than 100 km/h inside the appliance. Each and every component is designed in a way that you are promised optimum air flow to achieve maximum air throughput. Great for Houses with Pets: The appliance is equipped with a TurboTeQ brush to get rid of all the hair and fluff that comes with having a pet at home. The HEPA Lifetime filter promises great cleaning results over the years. Bulky Product: The vacuum cleaner is a little bulky, making it tough to store if you have restrictions when it comes to space. Confusing Instructions Manual: The product comes with an instruction manual that can be difficult to understand and navigate as it lists a number of different models. The turbo brush comes with its own separate instruction manual. Restricted Reach of Hose: While the hose is shown to be 3.5 metres long, it only reaches a distance of about 1.7 metres realistically when it comes to on ground use. Fewer Power Settings Than Other Versions: Instead of the six power settings available in standard Miele bagged cylinders, the CX1 line comes with only four settings, making it a little weaker than versions with a bagged canister. 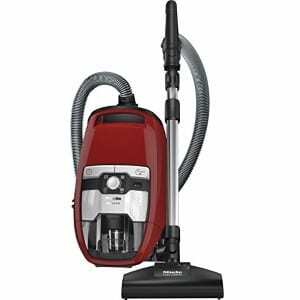 The price of the vacuum cleaner is a bit on the higher side but it boasts great air flow, a bagless feature and a great motor which helps it do its job well. If you have pets and are looking to make an investment that will last you years, the Miele Blizzard CX1 Cat and Dog PowerLine is a great bet that will pay for itself in the long run.